Our CSA is the heart and soul of our farm. We couldn’t make a living farming if it weren’t for these amazing folks who sign up each year. But to be honest, running a CSA can be incredibly stressful. Folks pay up front in the late winter for a full season’s worth of produce. The stakes are high for us. What if we have a major crop devastation? What if we get bad seed? What if the pests are so out of control we can’t control them organically? What if our irrigation gets turned off due to a drought? What if the weeds start growing faster than the plants (already a major issue!)? This season we’ve been blessed with some wonderful crops but we are also facing our biggest crop devastation of the spring. Hundreds of broccoli, cauliflower, cabbage and kohlrabi plants have been whipped out due to root maggot. There’s nothing more heartbreaking than seeing an entire field of brassicas that we’re once thriving all laying down on their sides and dying. We feel like failures when this happens and like we’re letting our customers down. We strive for diversity in our CSA and farmers market shares and it’s really difficult to watch a major part of our vegetable operation not come to fruition. However, that’s all part of being a farmer and it’s what being in a CSA is all about. Our customers are on a journey with us through thick and thin. We can celebrate the small victories of the season and weather the storms together. With all that being said, in our 8th year of farming we are getting better at focusing on what’s doing well and trying to shake off what’s failing. We’ve got a plan for our fall plantings of those veggies and feel confident that we can come out on top (something we’ve somehow managed to do each season). But in the meantime our CSA members will be working with what we’ve got, and trust me, we’re working our asses off to grow the best damn food we know how to grow. Mother Nature just isn’t always on our team. Right now the bok choy, leafy greens, and root veggies are thriving! Because I’m passionate about getting our customers excited about what is doing well and giving them ideas of how to prepare these veggies in the kitchen I’m happy to share this week’s recipe. Todays it’s a bok choy salad kind of day and I hope our customers love this recipe as much as we do. Also–If you’re interested to see what goes into our weekly CSA shares you can follow along on Instagram or check out our Farm Website. This simple recipe uses good quality meat from our favorite rancher and some of the best damn bok choy we’ve ever grown! The bok choy is prepared simply on the grill and the beef is tossed in a lovely sesame ginger sauce. This is one of those wonderful recipes that comes together quickly with minimal effort but tastes like you spent hours in the kitchen. Grab a fork, crack open a beer and enjoy the flavors of the season. Cheers to working with what we’ve go! Whisk together all the ingredients for the sauce. Taste for seasonings and adjust as needed. In a large skillet heat the olive oil over medium-high heat. Add the garlic and sauté for about 1 minute. Stir in the ground beef and use a wooden spoon to help break up the meat a bit. Cook, stirring often until browned, about 3-5 minutes. Drain off any excess fat and stir in the sauce mixture. Heat an outdoor grill to medium-high heat and lightly oil the grates. Toss the sliced bok choy with some olive oil and place cut side down directly on the grill. Cover the grill and cook until lightly charred, about 8-10 minutes. 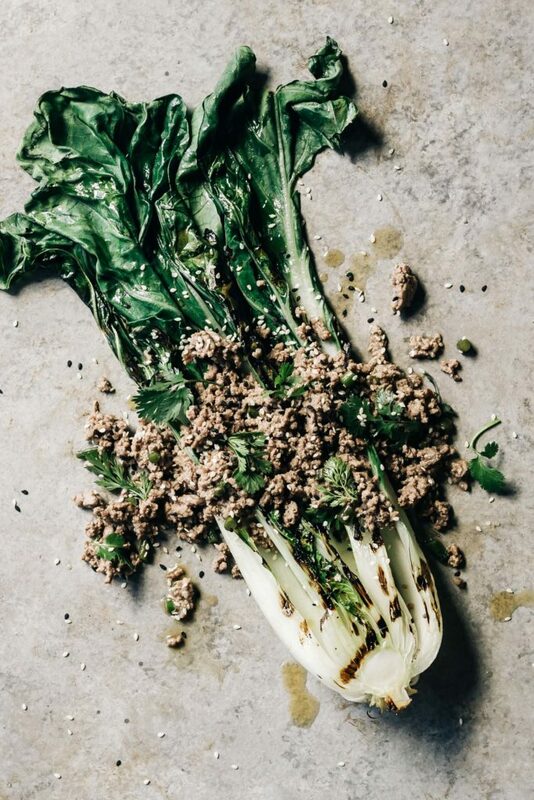 Serve the bok choy with the ground beef and top with the cilantro and toasted sesame seeds.